'I envy you, writing about Venice,' says the newcomer. 'I pity you,' says the old hand. One thing is certain. Sophistication, that modern kind of sophistication that begs to differ, to be paradoxical, to invert, is not a possible attitude in Venice. In time, this becomes the beauty of the place. Once gives up the struggle and submits to a classic experience. Once accepts the fact that what one is about to feel or say has not only been said before by Goethe or Musset but is on the tip of the tongue of the tourist from Iowa who is alighting in the Piazzetta with his wife in her furpiece and jeweled pin. Those Others, the existential enemy, are here identical with oneself. After a time in Venice, one comes to look with pity on the efforts of the newcomer to disassociate himself from the crowd. He has found a 'little' church - has he? - quite off the beaten track, a real gem, with inlaid coloured marbles on a soft dove grey, like a jewel box. He means Santa Maria dei Miracoli. As you name it, his face falls. It is so well known, then? Or has he the notion of counting the lions that look down from the window ledges of the palazzi? They remind him of cats. Has anybody ever noticed how many cats there are in Venice or compared them to the lions? On my table two books lie open with chapters on the Cats of Venice. My face had fallen too when I came upon them in the house of an old bookseller, for I too had dared think that I had hold of an original perception. -- Mary McCarthy, from "Venice Preserved" in Venice ObservedDespite the fact that her first chapter is an insistence that nothing original can be said of Venice anymore, I always find myself looking to Mary McCarthy's Venice Observed as one of the great volumes on Venice. It's a lovely dip into the history and atmosphere of the world's most fascinating city. I've read this before, so this time, everything had a familiar feel to it... perhaps like a lot of Venice (or any city) when you make a return trip... and since I'm planning to go back to Venice next month, it seemed like a good thing to re-read.The book is divided into small, self-contained chapters that focus on different elements of Venice's history or the author's experience with the city, always focused on the city and the people within it. McCarthy has a lovely way of strolling through the lessons in an effortless fashion, a font of Venetian wisdom. Even if she might have some small criticisms, she is always aware of the magic of the city, the thing that enchants us all, even if it's just a construct for tourists. The city has been a touristic location for four hundred years, after all. Its very existence is improbable and yet it continues to delight, spinning a history of the fantastic and surprising. Many of her observations, indeed, took root in my mind and stick with me as I think of Venice. In particular, her descriptions of qualities that took root in Venetian character, such as the Venetian's inventive and clever nature (the result of a city "with nothing of its own," and so it had "to steal and improvise"), or their complicated relationship with Rome on a political and religious level ("The pope was in Rome, and God was in heaven, but they were in Venice. "), and that Venetians focus on "applied reason" (there are no real Venetian writers or philosophers -- "Venetians printed books but seldom wrote them"). She discusses the fairy tale nature of the city (and how people tend to be surprised that Venetians were so money-oriented, but what are fairy tales except stories filled with treasure and gold?) and spends a great deal of time on the many people who have painted the city. McCarthy's prose is beautiful and detailed. Despite its short length, this really isn't a book one can gobble down with speed -- or at least one should not. It should be savored and the reader should take time to think about each chapter, lest they blend together and the nuggets of illumination be forgotten. Ideally, one might be the perfect companion to a drink while sitting in a Venetian square... because when one looks up from this book, that is the only view one wishes to look upon. One yearns for Venice after reading this book, and while the longing for Venice might always accompany those who have visited that magnificent city, there's something rather painfully delicious about piquing that hunger with books like this that make the city come alive in one's mind. If you're looking for a utilitarian guide to Venice, look elsewhere or be disappointed and possibly frustrated. "Venice Observed" is, as its title suggests, a collection of the author's observations about the city and its history, visual art, sociology, and music, of course, but also about the scholarship and literature inspired by it. The aptness of this seemingly circuitous exercise (Why read McCarthy's observations of Ruskin's observations of Venice when you can just read Ruskin's "Stones of Venice"?) is illustrated by her recognition that everything that one could possibly feel or think about Venice has already been felt, thought, and moreover, written about Venice. Thus, McCarthy's musings not only offer a window into the experiences of Venice that came before hers but also implicate all experiences to follow. For unlike that other great European canal city, Amsterdam, which has also once seen better days as the center of a global commercial empire, Venice never adapted itself to the ever-changing demands of modernization that might have prepared it to participate in the convocation of contemporary metropolisesbut rather Venice has long since succumbed to the tides of nostalgia and tourism, bearing it ceaselessly into the past. Das Buch mißfällt mir vom ersten Satz an: "Der kühle Verstand hat hinsichtlich Venedigs stets seine Zweifel gehabt." (Ich ziere hier nach der deutschsprachigen Augabe "Venedig" von 1999, ISBN 978-3426271247, S. 7) Hat er das? Und was soll hier eigentlich gesagt werden? Was auch immer: Wer etwas gegen Verstand und Vernunft sagt, hat erst mal jegliche Sympathie verspielt. Sicher ist das ein Vorurteil, aber doch wohl ein versta(e)ndliches.McCarthy gehörte zu jenen Glücklichen, die sich einen Wohnsitz in Venedig leisten können. Gottlob belästigt darauf nicht jeder Untalentierte - aber doch allzu viele - den Büchermarkt. Was soll man von jemanden halten, dem die bei der Anmietung einer Wohnung eingestanden wichtigste und dem Leser mitzuteilende Causa ist, "wie viele Personen die Wohnung im oberen Stock bewohnen würden" (S. 27), um dann gleich anschließend langweiligen Tratsch über seinen Vermieter auszubreiten (S. 28ff und passim)? Nur ihre vermutliche amerikanische Hinterwäldler-Prüderie bewahrt McCarthy offenbar vor der Auswalzung peinlicher Details.Die Autorin reproduziert überwiegend Angelesenes. Dagegen ist an sich nichts zu sagen und da ja zu Venedig schon "alles gesagt" (Johann Wolfgang von Goethe, Tagebuch der Italienischen Reise) ist, ist dies auch irgendwie unvermeidlich. Wenn es doch aber wenigstens interessant erzählt wäre! Originelle Sentenzen zu Venedig entgleiten McCarthy selten und eher zufällig. Ich bin geneigt, die Verallgemeinerung, "man findet sich damit ab, daß, was man im Begriff ist zu sagen oder zu empfinden... jedem Touristen aus Iowa auf der Zunge liegt" (McCarthy S. 20), doch eher zurückzuweisen. McCarthys "man" ist auf jeden Fall zunächst sie selbst und "man" kann sie wohl durchaus mit jenem Iowaman gleichsetzen, der in den USA als sprichwörtlich einfältiger Hinterwäldler gilt, denn Seattle liegt nicht nur hinterm Walde, sondern auch noch hinter den Bergen. So ist wohl auch etwa der Plural S. 24 zu deuten: "Für uns ist die venezianische Geschichte ein Kuriosum..."Um vielleicht noch Zweifelnde von meinem Negativurteil zu überzeugen, ein paar Blütenlesen halbgebildetem Unsinns: "Bronzepferde des Nero" (S. 10); "er (Napoléon) die Piazza S.Marco mit dem Bau der Fabbrica Nuova abschloß" (S. 11, 107) Den Fehler, die Ala Napoleonica mit den Rialtomarkthallen zu verwechseln, hat McCarthy wohl von William Dean Howells (Leben in Venedig. Deutsch v. Gertraud Michel hg. v. Wolfgang Barthel Berlin 1987, S. 40) abgeschrieben. Und der wiederum geht wahrscheinlich auf eine Verwechselung zurück: Die Gebäudeteile mit den Amtsräume im Dogenpalast wurden im Unterschied zum relativ kleinen Bereich der Dogenwohnung als fabrica bezeichnet. "Venedig ist eine Faltpostkarte seiner selbst" (S. 14); "hockt in den Stadtbibliotheken die... Gruppe von Nichtstuern" (S. 16); die Venezianer "haben (außer Höflichkeit) nichts anderes zu tun" (S. 17); "der heilige Hieronymus wird, dank seinem (die Übersetzerin hatte offenbar Schwierigkeiten mit der deutschen Grammatik) zahmen Löwen, zum Lieblingsheiligen Venedigs" (S. 22); die "'degenerierten' Venezianer der Renaissance... (verkauften) ihr Erstgeburtsrecht für ein architektonisches Linsengericht" (S. 34); Enrico Dandolo sei "gefügiges Werkzeug... aus Habsucht" für die Hohenstaufen gewesen (S. 37); "die unverbesserlichen Venezianer" (S. 39); der Doge Francesco Foscari sei "in kurzem Prozeß abgesetzt (worden), weil er die Partei seines Sohnes ergriff" (S. 50); der Bannerträger des Putschisten Baiamonte Tiepolo sei "von einem Ziegelstein (Vielleicht hat hier auch nur die Übersetzerin versagt.) erschlagen" worden (S. 54, 61); "Die Geschichte Venedigs... ist merkwürdig farblos2 (S. 55); der Sieg von Lepanto wurde von den Europäern "nie ausgewertet (sic! )..., weil Spanien der Anblick eines venezianischen Schiffes nicht gefiel" (S. 72); das Friaul sei "halb albanisch" (S. 83); "Harry's Bar in Torcello" (S. 95); das Eintreffen der Flotte Carlo Zenos während des Abwehrkampfes gegen die Genuesen im Chioggia-Krieg sei "der einzige heroische Augenblick in der Geschichte Venedigs" (S. 104); "die Vergangenheit hat hier in Chioggia einen üblen Geruch, wie stinkende Pisse2 (S. 105); "das sybaritische Venedig der Renaissance" (S. 114); "untergeordnete Rolle, die die Venezianer in allen Künsten, außer dem Mosaik, gespielt haben" (S. 119); "Venedig... brachte nur einen einzigen Architekten hervor - Palladio" (S. 120) - Padua und Vicenza haben sich zwar gestritten, "Palladio ist unser", Venedig aber hat niemals darauf Anspruch erhoben und er hat nie in Venedig gewohnt; "...wurde Giorgione in das Zeitalter des Amateurs hineingeboren2 (S. 138); "bedeutungslose Krone Zyperns" (S. 139); "Muße des Renaissanceadels - die einfach Massenarbeitslosigkeit war" (S. 140); "die Orgel wurde in Venedig entwickelt" (S. 162).Und wozu soll eigentlich die Aufzählung, wie alt Maler in Venedig geworden sind (S. 22-23), gut sein (Die hat dann wohl James Morris (Dreimal Venedig. Aus dem Engl. v. Hermann Stiehl und Christian Röthlingshöfer. überarbeitete Auflage München 1983, S. 38) abgeschrieben (zuerst London 1960, 1963, spätere englische Ausgaben teilweise revidiert/erweitert 1974, 1983, 1993))? Oh Schreck - da fällt mir ein, daß ich in mein Venedig-Manuskript gerade eine Aufzählung der Turmzusammenbrüche eingefügt habe. Da werde ich mich also rechtfertigen müssen, was das soll!Irgendwann hat die Autorin wohl gemerkt, daß sie nicht genug Stoff hat, um ein Venedig-Buch zu füllen. Und so hat sie den Text zunehmend mit unsystematischen Beschreibungen und teilweise fragwürdigen Interpretationen von Gemälden aufgefüllt (S. 70-71, 85-91, 93, 100-101, 109-112, 116-119, 122-133, 137-160, 166-168). Da kann ich dem Verlag, abgesehen vom Vorwurf, dieses Buch überhaupt gedruckt zu haben, die Frage nicht ersparen: Was soll der Leser mit Bildbeschreibungen/-interpretationen anfangen, ohne daß diese abgebildet sind? Warum hat sich McCarthy nicht an ihren Landsmann Howells (S. 143) gehalten: "Ich bin sicher, keiner, dem der Beruf des Künstlers fremd ist, war jemals in der Lage, sich irgendein Bild richtig vorzustellen, wenn er nur die Beschreibung gelesen hat, und sei sie noch so sorgfältig und genau. "Zu Bildinterpretationen sind Experten zu empfehlen, ich zähle hier nur die neuesten Bildbände auf (natürlich gab es auch schon genügend davon zu Zeiten von McCarthy): Oskar Bätschmann: Giovanni Bellini. Meister der venezianischen Malerei (München 2008); Gottfried Boehm, Alan Cong, Anne Distel, Dario Gamboni u.a. : Mythos Venedig. Von Canaletto und Turner bis Monet (2008); Matthias Bleyl: Deckenmalerei des 18. Jahrhunderts in Venedig: die hohe Kunst der Dekoration im Zeitalter Tiepolos (München 2005); Markus Ewel: Das Darstellungsproblem "Figur und Landschaft" in der venezianischen Malerei des 16. Jahrhunderts (Hildesheim/Zürich/New York 1993); Cornelia Friedrichs: Francesco Guardi - venezianische Feste und Zeremonien: die Inszenierung der Republik in Festen und Bildern (Berlin 2006); Andrea Gottdang: Venedigs antike Helden. Die Darstellung der antiken Geschichte in der venezianischen Malerei von 1680 - 1760 (Dissertation Kiel 1999, Wien/München 1999, 2002); Hans D. Huber: Paolo Veronese. Kunst als soziales System (2005); Gabriele Köster: Künstler und ihre Brüder. Maler, Bildhauer und Architekten in den venezianischen Scuole Grandi (Berlin 2008); Axel Limpert: Bildvergleiche von Ereignisdarstellungen in der Renaissance. Das letzte Abendmahl von Leonardo da Vinci, Jacopo Tintoretto und Tiziano Vecellio (Norderstedt 2007); Ruggero Rugolo: Venedig auf den Spuren von Bellini, Carpaccio, Tintoretto, Veronese (Florenz 2003); Norbert Schneider: Venezianische Malerei der Frührenaissance. Von Jacobello di Fiore bis Carpaccio (2002); Giovanna Scireì Nepi: Malerei in Venedig. Photographien v. Piero Codato und Massimo Venchierutti. Übersetzung aus dem Ital. v. Ulrike Bauer-Eberhardt und Barbara Geratz Matera (München 2003); Martin Seidel: Venezianische Malerei zur Zeit der Gegenreformation: kirchliche Programmschriften und künstlerische Bildkonzepte bei Tizian, Tintoretto, Veronese und Palma il Giovane (Münster 1996); Wolfgang Wolters: Der Bilderschmuck des Dogenpalastes. Untersuchungen zur Selbstdarstellung der Republik Venedig im 16.Jahrhundert (Wiesbaden 1983); Astrid Zenkert: Tintoretto in der Scuola die San Rocco: Ensemble und Wirkung (Tübingen/Berlin 2003).Ob McCarthy mit ihrem Venedig-Buch eine Schaffenskrise übertünchen wollte, ist mir nicht bekannt, das schwache Ergebnis scheint aber darauf hinzudeuten. Damit wäre sie ja auch nicht die erste. Gegenüber ihrem - ebenfalls amerikanischen - Vorgänger, der selbst im Versagen noch ein kraftstrotzender Riese war, erscheint sie allerdings als mickeriger Zwerg. Ein ordentlicher Verlag hätte einem Autor das Manuskript um die Ohren gehauen. Mit einer Dame tut man natürlich so etwas nicht. Full to the gills with guidebook perusing in anticipation of a future trip to italy, I looked to find more literary fare in this book, which I did. A cleaver outpouring of personal anecdote, history, art criticism and imaginative musings, the author unfortunately is just as overwhelming, Best read in short bursts, and could have used photos of the people, places and artwork she voluminously mentions. Pictures would have made better sense out of her thousands of words about them. Won't deter me from reading her possible similar interior monologue about Florence though. She can write, and her intelligence takes you into places where guidebooks can only leave you at the door. I picked this up today to read the first chapter to see what I thought of it. I didn't want to put it down and kept on reading until I finished it tonight. McCarthy's descriptive and intelligent writing completely immersed me in the unusual world of Venice. Next time I read it I will probably watch a documentary on Venice first so I can see in my mind's eye all the architecture, art, and people she wrote about. I do recommend it, especially if you are interested in the art and history of Venice. 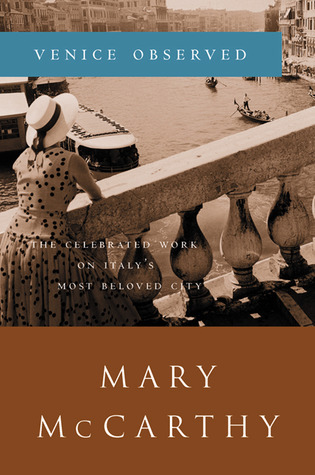 Delightful "profile" of Venice, Venetian art, people, and places...McCarthy has no background in art history so I take some of what she says with a grain of salt, but it is a wonderful literary portrait of a city. Heavy on analogy and metaphor but strikingly well-researched and thorough; she draws some stunning connections and reveals some hilarious minutiae about Venetian character and history. For the tourist who tires of hagiography at every turn and wonders tentatively if it's permissible not to like every painting in every church and gallery she enters. With clear-eyed wit, McCarthy examines a city whose entire identity and history is wrapped up in being observed, yet finds fresh facts and novel interpretations. Probably the best book about Venice I have ever read. McCarthy is an amazing observer and her writing takes my breath away.I have read its 158 short pages twice now, put in many markers, and want to read it again. Well-written, thoughtful observations on the social, political, religious, and artistic (architecture, painting, and music) history of Venice from a mid-20thc perspective. This and THE STONES OF FLORENCE. I found Mary McCarthy in an essay anthology and bought this based on that. Not as good as her political writing and literary criticism, but a nice read. an intelligent commentary on various aspects of Venice -- its art, its artists, its (lack of) architecture, its (lack of) great thinkers. An original interpretation, short and thought-provoking. Read this in Venice. Quite dated now, and not as good as Stones of Florence, but McCarthy's writing is a great cross between journalistic, poetic and personal.